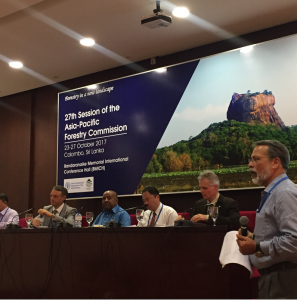 The 27th Session of the Asia-Pacific Forestry Commission, taking place at the Bandaranaike Memorial International Convention Centre, Colombo, Sri Lanka from 23-27 October 2017, started with a partner event on the future of forests to be assessed in the forthcoming 3rd Asia-Pacific Forest Outlook Study “The future of forests and forestry in Asia and the Pacific: The path to 2030 and beyond”. Convened by the FAO Regional Office in Bangkok, a number of international organisations including IUFRO were invited to a panel discussion to share their views on likely developments and probable pathways of change taking place in and around forests in the Asia-Pacific region. The aim of the outlook study which is expected to be completed in 2019 is to identify appropriate interventions at all levels to ensure that forestry meets the changing needs and aspirations of an evolving Asian society. With regard to the bio-economy, Dr. Kleine noted a significant shift towards biomass for economic activities, largely as a substitute for non-renewable sources such as oil and natural gas. Sparked by the Paris Climate Agreement, unacceptable levels of pollution in many mega-cities around the world and growing world population, demand for biomass including wood and non-wood products, fibre and other products will steadily increase. Without adequate governance and management systems in place, this might lead to unsustainable exploitation practices with increase in the pressure on bio-diversity, water resources and other vital environmental services. In responding to the question as to how forest science can assist in addressing future challenges of forests in the Asia-Pacific region, Dr. Kleine mentioned two main areas of attention: accelerating developments in science and technology and improvement of uptake of more environment friendly technologies. As for science and technology he mentioned the use of remote sensing for rapid forest and landscape assessments as well as modern communication technologies allowing for decentralised monitoring through local experts and through citizen science; development of improved systems for dealing with big data, advances in genetic engineering and micro-biology for adaptation of trees to a changing climate and pathogens as well as development of high value products from tree-based fibre through nano-technology, bio-chemical processes and artificial intelligence. Besides advances in biophysical research, successful transformation of the forest sector will also depend on the increased uptake of more environmentally friendly technologies. Towards this end, Dr. Kleine highlighted the need for better science and policy integration through increased research on policy and social issues; advancement in system’s thinking to break disciplinary boundaries; better integration of research and development practices, in order to enhance understanding of the problems, data collection and monitoring as well as enhanced communication of science/evidence-based facts through all possible channels in order to counter fake news. The views on future challenges for forests and the forestry sector shared by IUFRO in this FAO Outlook Study Partner Event are based on results obtained from a wide range of scientific and policy sessions that took place as part of the IUFRO 125 Year Anniversary Congress held in Freiburg, Germany in September 2017. This post addresses key issues for the future. Very interesting read!